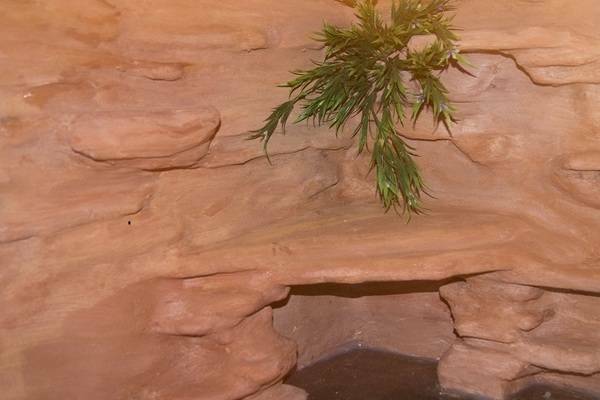 Getting your bearded dragon house setup right first time will not only help make your bearded dragon happier and healthier, but also save you money in the long run… and potentially unnecessary heartache. Here are the 7 essential must haves when setting up your bearded dragon habitat whether starting out or established. Environmental enrichment is so often forgotten and is a key element of setting up effective housing. 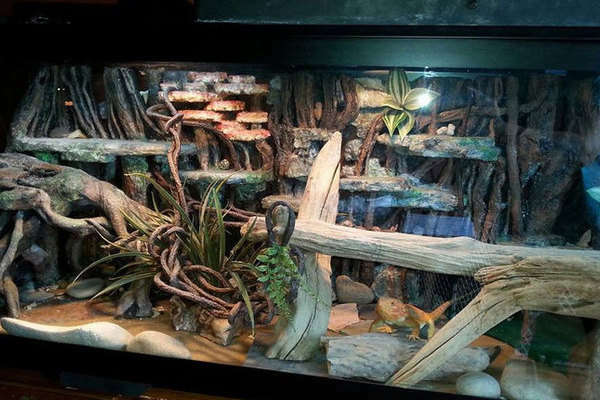 Not only does your bearded dragon benefit from a well thought out and setup environment, but it is also aesthetically pleasing to the eye for us to look at. Plus we get to see our bearded dragons thrive, and that is a real buzz. Housing for bearded dragons is not just a place for it to live in, it can make the difference between a long healthy and enriched life compared to illness, or worse. How to set up your bearded dragon cage to be aesthetically as well as functional has a multitude of benefits for pet and owner. In Australia each state regulates the keeping of reptiles is which includes the minimum standard of housing that can be provided to bearded dragons (or any lizard). 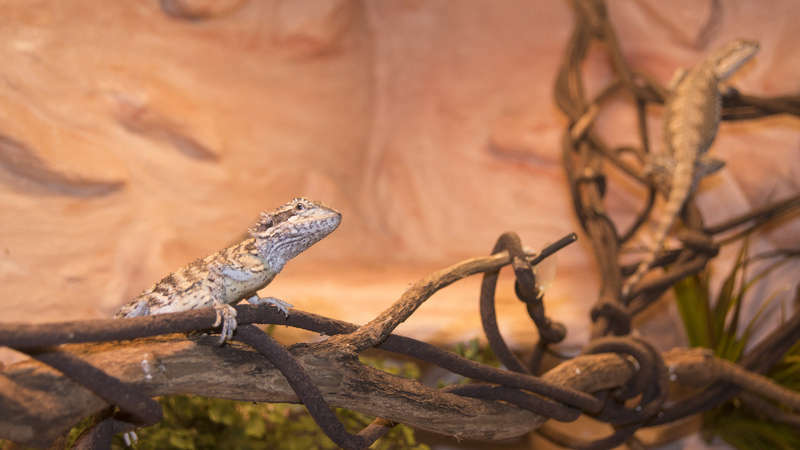 For this article, the Victorian State Government’s Code of Practice for the Welfare of Animals – Private Keeping of Reptiles is being applied. Regardless of what country you live in, if the keeping of reptiles is not regulated then this provides a minimum level of care as set by the bearded dragons native country. If you are in Australia, then you will be required to adhere to your state’s regulations. Let your reptiles physical health and psychological wellbeing be the primary factor for selecting the best housing, not price. If price is a limiting factor then be wary of becoming a reptile owner, vet bills alone can be crippling. Having said that, it is possible to have fabulous housing without spending a fortune. When setting up your bearded dragon habitat it is really important to understand the animals natural environment and behaviours in order to provide a habitat that supports a healthy and happy bearded dragon. How easily it can be cleaned including disinfecting. Outdoor enclosures have different requirements which are discussed in this article. How easily the animal can be accessed. Inadequate access can lead to frustration and will certainly be problematic if the animal is injured or ill.
How much room there is to move both vertically. Bearded dragons are semi arboreal, unfortunately something often not taken into consideration. They need branches and perhaps vines to climb. How much floor surface there is to move without objects and room to set up accessories. Access to temperature gradients, humidity levels and lighting cycles suitable for relevant factors including biological and seasonal. Good air circulation especially in climates with high humidity. Two main factors are height of the enclosure and the material used to create the enclosure. Vents should be at the sides and top of the enclosure. Glass enclosures are not generally designed with good air circulation. Free from distress including other bearded dragons. How safe is the animal from cats or other possible sources of harm when you aren’t looking. Surfaces and equipment cannot cause injury including cuts, abrasions and burns. Ease of securing accessories to prevent harm from falls (both accessories falling on the reptile or the accessory falling while the animal is on it). Prevents access to harmful substances. Wood can make a good enclosure surface but something a little more impervious like melamine will do better for being waterproof and easily cleaned. Both are easy to fix accessories to and it is easy to increase vents if needed. Glass tanks, or terrariums are very popular due to their low initial start up cost (although their price can easily be matched by a DIY enclosure). They are cheap because the manufacturers can standardise production and are relatively easy to mass produce. So they are great for the manufacturers and pet shops that need to sell you an attractively priced deal to get your business. What is best for the occupant of the enclosure is not top priority in this equation. Glass does a fabulous job at keeping in liquids and gasses, in fact it is one of the properties that makes glass so useful to us humans. Add to those properties of glass the fact that tanks are typically bought far too small for the occupant and the vents are small, they aren’t ideal for circulating any reasonable volume of air, even if the top is mesh. Since excessive humidity is quite problematic and it is really difficult to reduce excessive humidity, it is best to avoid enclosures that exacerbate the problem. Having said that, glass is fabulous for cleaning and disinfecting. Fiberglass, melamine and even wood will also inhibit air circulation, but these are materials that are far easier to work with to install large vents at any time (if they aren’t already in place) and attach accessories if needed. It is also difficult to attach accessories to glass outside of a suction cap which is not necessarily trustworthy and makes it inconvenient to position things correctly and adjust as needed. Lastly, glass reflects and this can cause distress to the bearded dragon when it cannot tell the difference between its own reflection and that of another bearded dragon. This can be a problem whether the its a glass tank or housing with melamine doors. 2. What size does my bearded dragons house need to be? For 2 bearded dragons the housing floor space must be at least 2.5 x the lizards length (head to vent) wide by 2 x its length long set by the Victorian State Government’s Code of Practice for the Welfare of Animals – Private Keeping of Reptiles. Once you factor in the size of area required to provide a thermal gradient and natural activity, clearly going with anything under 4 foot is not going to work well. Unfortunately that is a pretty dismal size for an animal that can travel hundreds of meters a day in the wild. It will not provide enough room to set up accessories that encourage natural activity and the smaller you go, the higher the concentration of pathogens which means more cleaning or more vet bills and so on. Don’t go small. There is no limit in the size of house for your bearded dragon, go as big as you can while keeping in mind the level of light and heating that will be needed. A six foot indoor enclosure is a great starting size. Even if you are rearing a juvenile, this size enclosure is fine. If you have heard they get scared by a large enclosure…come on. Firstly you cannot even provide a thermal gradient in anything too small which is just an instant recipe for disaster. Secondly, can you imagine that these reptiles that we keep that have not yet evolved for captivity sitting out there after hatching too scared to move because the world is too big for it? If the animal is showing fear in captivity, then its environment setup needs to be reviewed. The bearded dragons species vary in their habitat and that has some impact on behaviours. We know from research conducted by Wotherspoon that the Pogona barbata is quiet semi-arboreal. These natural activities should be catered for in the environment by providing the right size of housing to setup accessories in a manner that supports their natural activity. So in conclusion, the best housing for bearded dragons is not a single enclosure but preferably one outdoors that provide uninhibited access to sunlight (shelter and so forth of course) and an indoor enclosure of perhaps melamine and at least 6 foot long. 3. What Lights and Heating do I need? There are many options available on the market for bearded dragon lighting and heating however, not all are suitable. Since the lighting and heating can be quite expensive and the pet industry has almost no regulation over it, it is vital to understand what you are buying before handing over the money, especially since you will be the one paying the vet bills if it isn’t right. There is no room whatsoever to skimp on the best lighting and heating, although a house out in the sunshine will help compensate for mistakes. Plenty of room to save money on accessories and even housing if you are good at DIY. 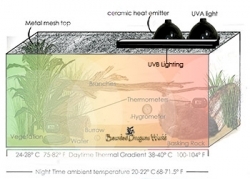 To understand how to setup heating and lighting and what the best bearded dragon light setup is, go to the post on Setting up Heating and Lighting. This page just outlines summary to get you started and wade past confusion if there is any. The dimensions of the housing (How tall, wide and deep is the house? With that in mind you can see that a simple answer is impossible. 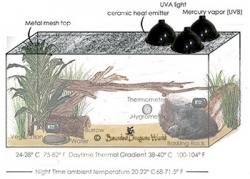 However, as a general guide, I would recommend the basics for a single bearded dragon light and heating setup for a 6 foot house are a UVA light, ceramic heat emitter and for UVB either a mercury vapor bulb or a fluorescent strip light (do not get compact fluorescent lights). ✓ Connect up automated day/night controls. × Do not connect to thermostat temperature control. Lights such as the Zoo Med PowerSun UV Mercury Vapor Lamp are common to use. I have used 100 watt without any issues however I also provide outdoor housing for sunny days so there isn’t total reliance on artificial lighting. Do not connect mercury vapor bulbs to thermostats as part of the heat control. Some thermostats have added functionality with day/night controls which are simply a timer to turn the light on and off, that is fine. You can attach it up to a timer, just not where the thermostat will be turning the bulb on and off all day long to adjust temperature. The bulb will not survive the it and one can only imagine how disruptive that would be for the reptile. UK and a few other locations can purchase Arcadia products. Arcadia is a company that is focusing on producing products that support the wellbeing of the animal intended for. That is not always the case by any means so it is worth looking into these guys. The 100 watt Arcadia D3 UV Basking Lamp has a lifespan of 6000 hours which is good for UVB lights. 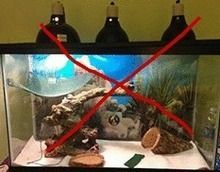 It is best to have more than uvb bulb available (always have spare, they never break at convenient times) so you could get a lower wattage as well like the Arcadia D3 UVB 80 watt Basking Lamp to change about if the weather gets warmer or colder providing a little more flexibility in the setup for the animal. Remember to check the manufacturer’s instructions for the placement of the bearded dragon light setup (distance between the animal and the light). Arcadia recommend for these bulbs 20-30 cm between the light and the bearded dragon [specifications and placement details here]. Mercury vapors have the best reputation when it comes to UVB lighting but the fluorescent strip lights are another way of providing UVB. The strip lights are not the same as the compact UVB lights which will not be discuss here. If you need more information on that, go to the article Setting up Heating and Lighting. Covering one third to half of the habitat with a strip light will be sufficient. Do not cover the entire enclosure with lighting, they need to be given the opportunity to get out of the UVB as they choose to. Bearded dragons are quite capable of knowing when they need to bask, soaking up UVB and when they need to move out of it. For the fluorescent strip lamp there is the 22″ Zoo Med 26061 Reptisun 10.0 T5-Ho Uvb 24W Fluorescent Lamp which can be fitted into the 24″ Zoo Med or Reptisun T5 Ho Terrarium Hood. If you can get the Arcadia range then the D3 fluorescent lamp is their best strip light which you can see on their website here. UVA lamps are essentially just producing white light, the same as what you or I use in the house. It is believed (not yet scientifically proven) that UVA impacts how reptiles see their environment and therefore influences how they behave in their habitat. It just seems logical but certainly you will find most report a change in behavior according to light levels. You don’t want so much UVA that it is blinding for the animal which is undoubtedly staring into the light for much of the day. On the other hand it needs to be enough that natural behaviours are encouraged. Some of the UVB lights will say they are also UVA. If you intend to go without UVA lighting you will need to check if your setup is sufficient, particularly by monitoring the reptiles behaviour. In the environments setup by Arcadia to show the comparison between the T5 and T8 fluorescent lamps, it is possible that the T5 could be enough. Something like the 75 watt Exo Terra Intense Basking Spot light has an opaque surface so it’s not so intense on the eyes and is a good starting point. should be a good starting point and you can go higher or lower later on if you need to change. Remember that these UVA bulbs contribute to overall heat, they are intended to. × Do not connect up automated day/night controls. ✓ Do connect to thermostat temperature control. The simplest bulb of all is the CHE, actually its a heating element encased in ceramic. These are cheap, which is really good because it means you can keep a few of different wattages to help maintain the right temperature for different seasons. If you live in a particularly cold climate then you will need at least 100 watt and perhaps additional heating on top of that. However, do keep in mind that the mercury vapor and the UVA bulbs listed above all produce heat as well. Outside of that a 75 watt should suffice. Be wary of going to high in a single CHE, most fittings cannot take the heat. If the climate gets particularly hot then you might need little more than a 50 watt CHE. But most of us live in climates with quite varied seasons so it is best to keep a range of say 100, 75 and 50 watt CHEs for heating the reptile house, this way you also have spares. Of course you do not need to change out CHEs for different seasons as the thermostat will cut in and out as it needs, but it is less wear and tear on the thermostat plus less variations in temperature if you adjust the CHE wattage for the season. If you aren’t using a thermostat then you cannot control the environment properly and trouble will undoubtedly ensue. Really important to have one for the comfort of the animal. The different shapes of CHEs DO make a difference in heat distribution! The shape of the CHE determines how the heat will be distributed. A flat surfaced CHE will distribute heat uniformly downwards over the area it is focused on. A concave shaped CHE provides a radiant type of heating and convex is for a wide area. The flat CHE is probably about the best way to go for the setups on reptiles because it will focus the heat downwards more than the other shapes which helps reduce the amount of heat the lights and fittings which are very close will have to bear. Not such a problem with the lower wattages, but keep the level of heat the fittings must endure in mind. The color of CHE doesn’t make a difference to anything. Getting a fitting that can take the highest wattage bulb that you will ever use means you can interchange and not have to buy new lamps. In addition, it should be able to well and truly cope with the load of lower wattages especially heat wise (fittings can get quite hot). A lamp holder with a suitably reflective surface can increase the light and UVB output significantly which improves efficiency and effectiveness. Ensure it has ceramic fittings or at least that it is specifically designed to take the level of heat it will endure. The lamp holder should have either its own mesh barrier to prevent the animal touching it or be something that can be placed on top of a mesh top on the housing. The dome fittings can go on top of mesh enclosure tops. The fitting required for fluorescent strip lights has already been covered in the UVB lighting section above. Some light fittings will holds 2 lamps up to 100 watts each. Using a double light fixture will help save a bit of room by keeping two bulbs relatively close together. The UVA and mercury vapor bulbs could go in this fitting and then get the single dome for the heat lamp. 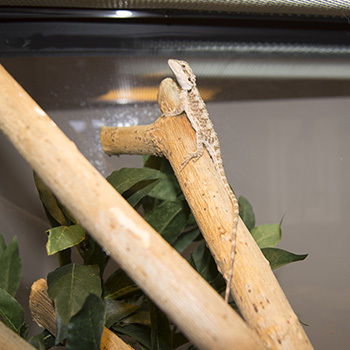 Domes are often just placed on the mesh tops of enclosures but they can also be placed on stands which are readily purchased online with the other reptile fittings and fixtures and in some pet stores. However, if you are building your own enclosure you have then start at the article DIY Enclosures before selecting lighting and heating. You might want to build it into your design. 4. Get a fire alarm, you totally worth it! For less than $30 you can get the First Alert brand battery operated combination smoke and carbon monoxide alarm making it easy to put anywhere. 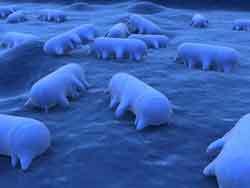 A minimum of 2 thermometers and 1 hygrometer should be set up in the habitat. One thermometer is placed in the basking spot and the other in the cool area. If you want help on where to setup for thermometers go to the lighting and heating post. Thermometers are so cheap that using a few in each bearded dragons house is fine. The good old dial works well and is just placed where you want to take the readings from along with the digital thermometer that has a probe which you place where will be taking the temperature reading from. Don’t use the flat tape style thermometers designed for sticking on aquariums. You can also use the digital laser infrared thermometer temperature guns but you have to keep interacting with that to get a reading. It is not as simple as just walking past your enclosure and noticing the temperatures. The hygrometer is placed somewhere centrally in the habitat. To understand the placement of environmental monitoring tools go to Complete Guide to Humidity for Bearded Dragons. When setting up your bearded dragon habitat, don’t skimp on the little things like thermostats and timers. They are so cheap and yet so important. You cannot possibly accurately control the temperature or lighting cycles manually in the bearded dragons habitat and it is not as simple as turning the heat on and leaving it no matter what. Even if you could just leave everything running at full capacity all day long, what happens at night time when everything cools down except the habitat which is now just making life uncomfortable, dehydrating the occupant and likely having some effect on its behaviour? A thermostat can save your sanity and certainly make the bearded dragons life a little more comfortable. Which thermostat to get is the trick. Some of them can drive you insane with their alarms going off at 3am in the morning when the environment temperature drops to low because even though the thermostat did its job turning the heating back on, it is taking far longer to heat up the environment than anticipated. So to do this justice I will do a review on thermostats in the near future. But you need to get a thermostat from day 1. Don’t spend lots of money on accessories. Keep it natural. Well thought out environments can stimulate natural behaviours which in turn reduce stress and improves health. The best accessories for your bearded dragon are rocks, branches, burrow (made up of rocks and branches) and bowls for food and water. Rocks on the floor of the habitat can be placed for resting on and grouped together to make a burrow. Research of bearded dragons in their natural environment has shown us that they spend a lot of time up trees, so place branches upright and let them climb. This will also allow them to adjust their own height to the lights and heating which means you don’t have to stress about whether it is set to high or too low. Branches can also be used with rocks to create hideaways (burrows). Lastly bowls don’t actually need to be bowls. Use the base of a plant pot or even a large tile. Food shouldn’t be grouped all in one spot allowing for one mouthful and its all gone so use a large pot plan base for food and similarly for water. Can my bearded dragon make me sick?